Indiana, meaning the "Land of the Indians", is a state of the United States with its capital Indianapolis. The U.S. postal abbreviation for the state is IN. A resident of Indiana is called a Hoosier. 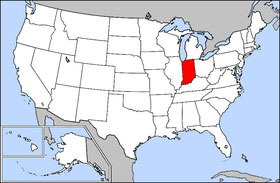 USS Indiana was named in honor of this state. Most of Indiana has exempted itself from the observation of daylight saving time (DST). The area that is within the Eastern time zone is legally exempt from daylight saving time; some counties within this area, particularly Floyd, Clark, and Harrison counties near Louisville, Kentucky, and Ohio and Dearborn counties near Cincinnati, Ohio, observe daylight saving time unofficially and illegally by local custom. Several counties in the northwestern corner of Indiana, near Chicago, Illinois, and several counties in the southwestern corner of Indiana are in the Central time zone and remain subject to daylight saving time. The history of this unique arrangement is fairly convoluted. When DST was formally adopted, Indiana was in the Central time zone. However, many parts of the state stayed on Central DST the entire year. Eventually, a long-fought battle in the Indiana state legislature led to the current compromise. In the past several years, there have been attempts to place the entirety of Indiana in the Eastern time zone, with Eastern DST, but these have proved impossible to implement. More recently, support has begun to grow for returning Indiana to the Central time zone with Central time zone DST, but this has not been popular enough to implement. There are 23 Indiana state parks, nine man-made reservoirs and hundreds of lakes in the state. State Motto "The Crossroads of America"
Indiana joined the Union in 1816 as the 19th state. The current Governor of Indiana is Joe Kernan (Democrat), the former lieutenant governor for Frank O'Bannon, who died of a stroke on September 13, 2003. The U.S. senators are Evan Bayh (Democrat) and Richard G. Lugar (Republican). Indiana is bounded on the north by Lake Michigan and the state of Michigan, on the east by Ohio, on the south by Kentucky with which it shares the Ohio River as a border, and on the west by Illinois. The total gross state product in 1999 was $182 billion placing Indiana 15th in the nation. Indiana's Per Capita Income is $27,011. The state's agricultural outputs are corn, soybeans, hogs, cattle, dairy products and eggs. Its industrial outputs are steel, electrical equipment, transportation equipment, chemical products, petroleum and coal products and machinery. In addition, Indiana has the international headquarters of the Eli Lilly and the US headquarters of the Roche pharmaceutical companies. The 2000 population was 6,080,485. Indiana is a state of mostly small towns and midsize cities. Its largest city and capital is Indianapolis, where the nation's most famous auto race, the Indianapolis 500, is held each year. Auburn, home of Auburn-Cord-Duesenberg Museum.